We are a privately owned family business covering the Cotswolds & Swindon. 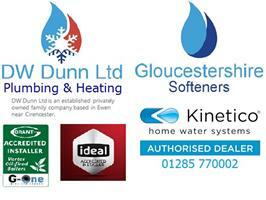 DW Dunn Ltd Plumbing & Heating have over 90 years of history looking after our loyal customers. · Power-flushing System upgrades including new radiators & towel-rails. We are a Kinetico Water Softener Dealership trading as Gloucestershire-Softeners and can supply, install, service and maintain your softener together with supply of salt - call for more information. We have 8 fully qualified plumbers, gas & oil engineers alongside our Apprentice Dan. We have customer support from our admin team headed up by Catherine and Lucy with Sally looking after our finances. Cirencester & all GL postcodes including South Cerney, Ashton, Keynes, Tetbury, Minchinhampton, Chalford, Swindon, Stroud, Gloucester, Cheltenham, Fairford, Lechlade, Filkins, Southrop, Malmesbury, Crudwell, Brinkworth, Purton, Cricklade, Wootton Bassett, Purton, Stoke, Leigh, Highworth, Carterton, Bampton, Aston, Buckland and Brize Norton.